Alibaba’s tenth Singles’ Day event – Sunday, November 11 – again set a 24-hour sales record, despite concerns about a slowing Chinese economy and the effects of the ongoing trade war with the United States. The Chinese e-Commerce giant announced that sales reached $30.8 billion (213.5 billion yuan) for the mere 24-hour period, as measured by gross merchandise value, which is total sales value for merchandise sold but excludes marketplace revenue from fees and other services. Those results represent an increase of about 27% over last year’s total at current exchange rates. That was, however, a tad smaller than the 39% year-over-year increase achieved in 2017 (the GMV figure also excludes Alibaba’s growing offline sales). Fortified by an entertainment extravaganza, the event garnered $1 billion in sales in 1 minute and 25 seconds. Revenue exceeded $10 billion in an hour! In contrast, sales for Amazon’s Prime Day 2018 totaled $4 billion for the 24-hour period. 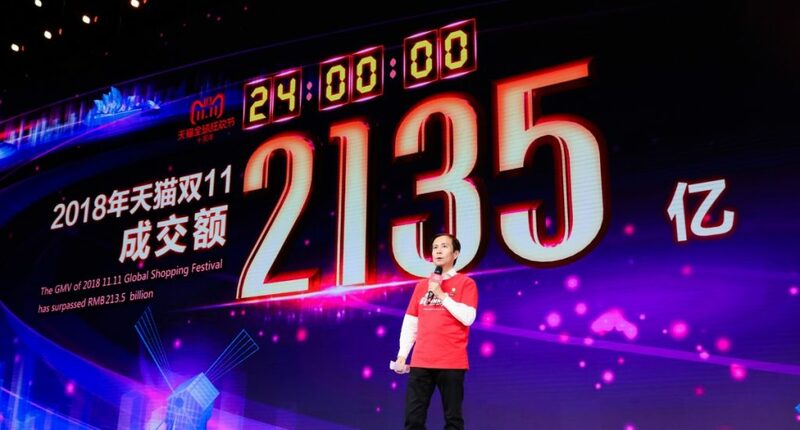 Singles’ Day, which occurs on November 11 every year, started in the 1990s as an unofficial holiday on Chinese university campuses. The date, when written as 11.11, looks like the Chinese expression for “bare branches,” a term that describes bachelors. Some 180,000 brands were available on the platform this year, including top international companies. Apple, Dyson, Kindle, Nestlé, Gap, Nike, and Adidas all had excellent sales, surpassing $14.4 million (100 million yuan) each. Cosmetics companies Lancôme, Olay, Estée Lauder, L’Oréal, Elizabeth Arden, and Shiseido also did well. Consumers in 230 countries completed transactions. Alibaba’s logistics subsidiary, Cainiao Network, processed more than 1 billion delivery orders. The iPhone was the top-selling smartphone brand, followed by Chinese players Huawei and Xiaomi. According to a statement from Alibaba, over 40 percent of consumers bought from international brands. In 2017, Alibaba purchased Lazada, a Singapore-based e-Commerce platform that has operations across Southeast Asia. This year, Lazada hosted its own Singles’ Day event. Lazada is very popular in six countries: Indonesia, Malaysia, the Philippines, Singapore, Thailand, and Vietnam. Lazada offers 300 million beauty, fashion, and household goods products. To help minimize the language barrier between cross-border buyers and sellers, Lazada used artificial-intelligence-supported translation technology within its chat tools. Along with Lazada, Alibaba houses its products and lines of services on a number of other platforms – Shopee, 11street, etc.. to name a few. Alibaba’s long-term strategy was to sell to consumers outside of China on Singles’ Day, especially to the Southeast Asia, in addition to selling international brands to Chinese consumers, and they had fulfilled just that. 11.11 Singles’ Day 2018 in Malaysia was a record-breaking one. Check out some of the stats shared by its three biggest e-Commerce platforms! On Lazada, among the top products were Milo, where Malaysians bought an incredible 27,000 tonnes, and diapers, which saw an astonishing 4.5 million of them ordered. Xiaomi smartphones proved a popular choice among Malaysians too, with 13,000 units ordered on 11.11 2018. One of the three biggest major online shopping platforms in Malaysia, 11street, didn’t do too badly either. Interestingly, one of the top selling categories in 11street during the 11.11 sales was Health & Beauty, in addition to Mobile & IT, Electronics, and Baby, Kids & Toys. Besides the usual Milo, gadgets, and e-vouchers, 11street’s top-selling products for 11.11 this year also included items like Brand’s Essence of Chicken and Eu Yan Sang‘s Gold Label Bak Foong pills. It may not be an e-Commerce platform, but cashback site ShopBack Malaysia definitely had an eventful 11.11 this year. It witnessed an immense traffic boost online, with at least 10 times app and website visits on 11.11 2018 compared to normal days. With the major e-Commerce platforms offering a large variety of deals, savvy Malaysians used Shopback as a means to save even more money on 11.11. In all, Shopback helped Malaysian shoppers save up to RM400,000 worth of cashback this year, which is 2.3 times higher than last year’s 11.11 sale. The highest amount of cashback saved by a shopper on 11.11 2018 was a hefty amount of RM4,263. 2018 Singles’ Day was a record-breaking one for the three biggest e-Commerce platforms in Malaysia, indicating a greater shift in consumer spending behaviour. There was also a larger amount of orders made on mobile apps compared to previous years, as Malaysians fully embrace the age of online shopping. However, this year’s sale also saw a slew of payment-related issues affecting all three platforms. While the surge in traffic undoubtedly affected the experience of navigating the sites, this year’s sale saw the payment gateway portals struggling to cope, resulting in many orders being unpaid throughout 11.11, and eventually being cancelled 48 – 72 hours later (depending on the platform, customers have a small window of time to pay for any order made).